Brought together in tough times, Miranda and Jeanette are now thriving together. Miranda, 14, was introduced to Walk With Sally when doctors were giving her mother just 6 months to live. Miranda was above average and excelling in school, but she began to get very irritable with the situation she was forced to face, cancer taking her mom away from her. Jeanette had been looking for a place to volunteer her time for the past two years before she found out about Walk With Sally’s mission. She knows first hand the devastation that cancer can have on a family after watching her little brother pass away when she was just 7 years old, and then having to watch it take her father at 18 as well. Cancer will affect the entire family, and she knew that she would be able to empathize and show her mentee that she was not alone. 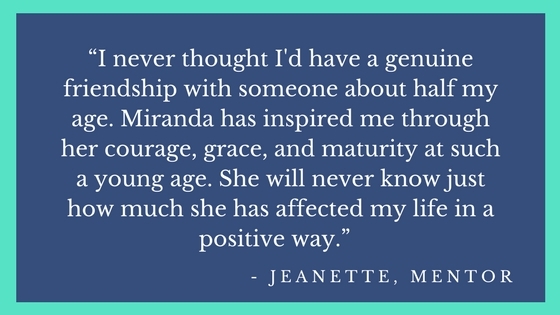 The most surprising piece of this friendship might just be the impact that Miranda has had on Jeanette. We know that the support of a mentor will help the mentee through a difficult time, but when you hear what Jeanette has to say, you’ll realize that this community is a support for all who are involved. You can join our community and make a difference by supporting friendships just like Jeanette & Miranda’s through our Friends of Sally program. A monthly gift could make a world of difference. This entry was posted in Impact Stories and tagged community, friendship, Mentee, Mentor, Quote.